In large skillet, cook turkey as specified on the package. Always cook to well-done, 165 degrees, as measured by a meat thermometer. Add taco seasoning mix and water. Cook until water is evaporated, stirring occasionally. Spread each taco shell with sour cream mixture. 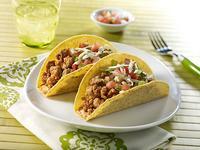 Fill tacos with lettuce, turkey, pico de gallo and cheese.